[152 Pages Report] The overall MEMS oscillator market was valued at USD 79.2 Million in 2016 and is expected to reach USD 802.8 Million by 2022, at a CAGR of 46.08% between 2017 and 2022. This report provides the size and future growth potential of the market across different segments such as packaging type, band, general circuitry, application, and geography. The study identifies and analyzes the market dynamics such as drivers, restraints, opportunities, and industry-specific challenges; and detailed value chain and Porter’s five forces analysis. It also profiles the key players operating in the market. The rapid growth of mobile infrastructure, electronic wearables, and Internet of Things is expected to propel the growth of the overall MEMS oscillator market. The base year considered for the study is 2016, and the forecast period is between 2017 and 2022. The research methodology used to estimate and forecast the MEMS oscillator market begins with capturing data on key vendor revenues through secondary research. The secondary sources include annual reports; press releases; investor presentations of companies; white papers; journals and certified publications; and articles from recognized authors, websites, directories, and databases. The vendor offerings have also been taken into consideration to determine the market segmentation. The bottom-up procedure has been employed to arrive at the size of the overall MEMS oscillator market from the revenue of the key players in the market. 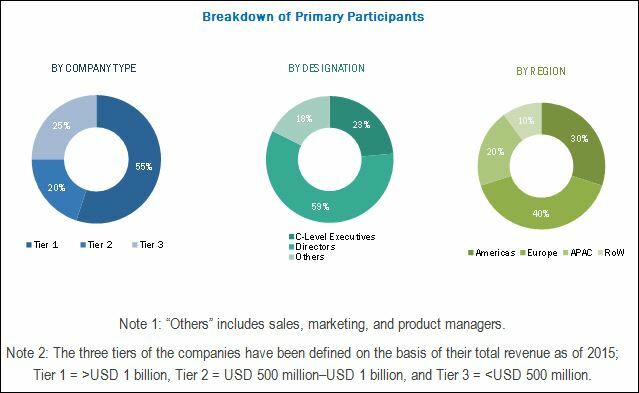 After arriving at the overall market size, the total market has been split into several segments and subsegments, which have been verified through primary research by conducting extensive interviews with key industry experts such as CEOs, VPs, directors, and executives. The data triangulation and market breakdown procedures have been employed to complete the overall market engineering process and arrive at the exact statistics for all segments and subsegments. The breakdown of the profiles of primary respondents is depicted in the below figure. The MEMS oscillator ecosystem includes the R&D phase, followed by raw material suppliers and original equipment manufacturers, such as SiTime Corporation (U.S.), Microchip Technology Inc. (U.S.), Vectron International, Inc. (U.S.), Abracon Holdings, LLC (U.S.), Daishinku Corp. (Japan), Ecliptek Corporation (U.S.), Jauch Quartz GmbH (Germany), IQD Frequency Products Limited (U.K.), ILSI America LLC (U.S.), and Raltron Electronics Corporation (U.S.). The MEMS oscillator market has been covered in detail in this report. To provide a holistic picture, the current market demand and forecasts have also been included in the report. Company Information: Detailed analysis and profiling of additional market players (up to five). 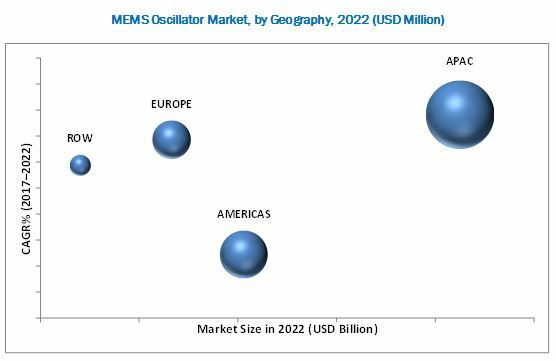 According to the forecast provided by MarketsandMarkets, the overall MEMS oscillator market was valued at USD 79.2 Million in 2016 and is expected to reach USD 802.8 Million by 2022, at a CAGR of 46.08% between 2017 and 2022. The growth of this market is driven by the rapid growth of electronic wearables, Internet of Things, and mobile infrastructure. Along with this, the rising need for electronic device miniaturization, improved performance, and increased functionality entails a growing demand for MEMS oscillators owing to their inherent advantages such as small size, high reliability, and low power consumption. This report segments the MEMS oscillator market on the basis of packaging type, band, general circuitry, application, and geography. In 2016, SPMOs held a major share of the market owing to their innumerable applications. However, the market for TCMOs is expected to grow at the highest rate between 2017 and 2022. This growth is attributed to their ability to solve deep-rooted timing problems in telecom and networking with their excellent dynamic performance under stressful environmental conditions; and their increasing penetration in applications that require higher accuracy and longer battery life, such as wearables and Internet of Things and mobile devices. Considering the market segmented on the basis of packaging type, surface-mount device package held the largest share of the market in 2016, while the market for chip-scale package is likely to grow at the highest rate during the forecast period. The wearables and Internet of Things application is expected to hold the largest size of the MEMS oscillator market during the forecast period. Explosive growth in interconnected devices and increasing adoption of wearable technology where MEMS oscillator is a preferred timing component, owing to its inherent advantages such as small size, low power consumption, and high reliability, are expected to drive the MEMS oscillator market. However, the market for networking, server, storage, and telecommunications; and automotive applications is expected to grow at high rates during the forecast period. In terms of different geographic regions, APAC is expected to hold the largest share of the market between 2017 and 2022. The Americas is expected to capture the second-largest share of the market during the forecast period. The wearables and Internet of Things; mobile devices; and networking, server, storage, and telecommunications applications are expected to be the leading segments of the MEMS oscillator market in the Americas. Actively managing performance and cost trade-offs without compromising on quality and reliability remains the biggest challenge for the companies in the MEMS oscillator market. The major vendors in the market are SiTime Corporation (U.S.), Microchip Technology Inc. (U.S.), Vectron International, Inc. (U.S.), Abracon Holdings, LLC (U.S.), Daishinku Corp. (Japan), Ecliptek Corporation (U.S.), Jauch Quartz GmbH (Germany), IQD Frequency Products Limited (U.K.), ILSI America LLC (U.S.), and Raltron Electronics Corporation (U.S.). These players adopted various strategies such as new product launches; and partnerships, agreements, and collaborations to uphold their positions in the market and to efficiently cater to the growing demand for MEMS oscillators from the end users.